Chen is a native of Guangzhou city (better known as ‘Canton’ to westerners in the past), the provincial capital of Guangdong province. Guangzhou is among the top three mega cities in China (the other two cities are Beijing and Shanghai) with an official population of over 12 million in 2015. Born in the 60s, Chen completed his formal education and took up a few jobs before he made up his mind to pursuit his aspiration in art and especially in oil painting. 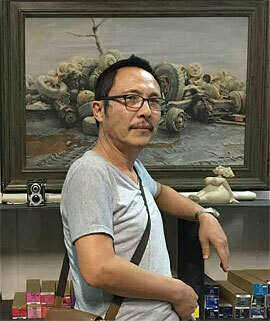 He enrolled at the Guangzhou Art Institute’s Senior Oil Painting Course and graduated in 2007. Since then, Chen has become a professional painter. Over the years, Chen collected substantial acclaims and honors in many art competitions. These days, apart from painting, Chen is also contributing his time, experience and skill to give lectures to the younger generation of Chinese contemporary artists. He is currently the Executive Director of Guangzhou Liwan District Artists Union and Vice Chairman of Xiao Zhou Cun Artists Association. Chen is living on an outskirt island in the Pearl River delta known as Sea Gull Island. His studio is sitting in the middle of a huge fish farm with the Pearl River flowing hastly south outside his windows.